If you are looking for a top down CPU cooler that is virtually silent and offers great performance you would be hard-pressed to find anything better than Scythe's Choten. The Choten CPU-Cooler uses a top-flow design to actively cool all surrounding mainboard components as the air flow is directed down. This has a positive effect on system stability and service life. During the development of the Choten, Scythe's focus was not only on excellent performance, but also on unrestricted compatibility with RAM. The asymmetric design coupled with a large gap between the motherboard and heatsink ensures excellent compatibility with large memory modules. 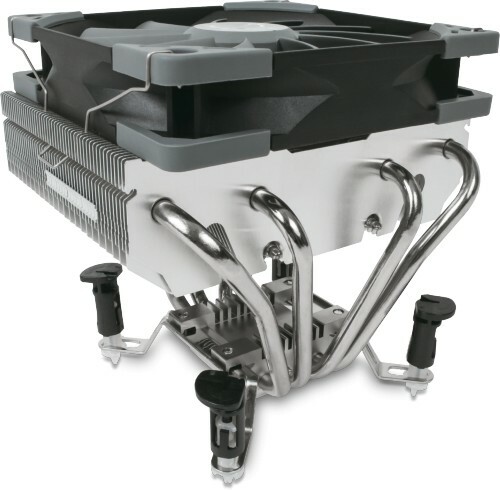 The cooler features a preinstalled Kaze Flex 120 PWM fan, giving the Choten CPU cooler a total height of only 120 mm, allowing it to easily fit into the majority of PC cases. This mix of good performance, high compatibility and high-quality axial fan makes the Choten an attractive CPU cooler for compact but demanding systems. Heatsink Details The Choten CPU cooler is equipped with the E.C.M.S II (Easy Clip Mounting System II) which offers support for AMDs latest AM4 socket as well as a wide range of other Intel and AMD sockets. The second generation of the E.C.M.S is designed for ease of use and fast installation. To achieve this, the mounting system consists of only two parts. The Kaze Flex 120 PWM fan uses a proprietary design with a FDB (Fluid Dynamic Bearing) for a quieter and more reliable operation with over 120,000 hours lifespan. The corners of the frame are covered by a rubber spacer to eliminate the transfer of any vibration inside the chassis and any unwanted sounds from the blade movement. The Choten CPU cooler features a top flow design with the advantage of providing active cooling to the CPU and power delivery components on the motherboard. The radiator is offset to improve the RAM compatibility while also maintaining a balanced shape. In addition, the cooler has a height of only 120mm with the fan installed, making it compatible with a wide range of PC chassis. Accessories Installation material for Intel and AMD Socket, thermal grease, installation manual.